To help you make an informed choice our decking review has been produced to explain in greater detail the many benefits of Mayfield products, including the extensive research and development involved, and the complex nature of the manufacturing process. 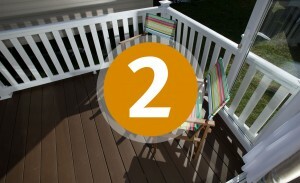 Why do Mayfield offer two different decking products? Because Mayfield understands that not everyone has the same budget to spend. Both Hampton and Focus have unique benefits and both are exceptional decking products. What makes our Hampton decking so special? Hampton decking is 148mm wide by 25mm in depth. 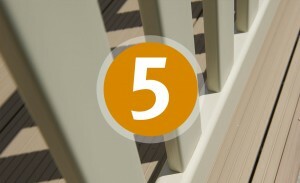 This unique size is designed to incorporate our very special decking clip and give a pre-determined gap between two decking boards of 5mm, which is crucial for noise resistance. Within these colours there is also a wood type pattern effect to further enhance the finish – another unique feature of this incredible product. Hampton has been certificated to British Standard BS EN607. Not only is Hampton decking colour stable, it is also is the only decking product to have passed and been certificated with UL94 V-0 fire rating. What is Hampton decking made of? 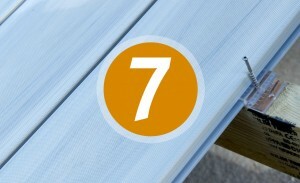 The inner core of the decking is made from graded recycled uPVC. The grading has a strict criteria in that it must come from a sustainable stock, have full recycle traceability, be the correct K-Value (stiffness of material) and have all the right resin ingredients such as impact modifiers and elastomers. The surface finish (or cap as it is industry known) is made using a very special blend of polymers which is a closely guarded secret of Mayfield. These specially formulated advanced polymers give the highest level of UV protection, allowing us to offer our customers a 12-year warranty against fading and surface whitening commonly found on many other decking products. What is unique about our Focus decking? 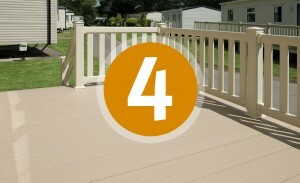 Focus decking is a 236mm wide by 30mm in depth. Like the Hampton decking this also a unique size and has been designed specifically for the holiday home and static caravan industry. Focus decking uses the same special decking clip as the Hampton to give the same pre-determined gap of 5mm between the planks. This is crucial for noise resistance and the through flow of surface water and waste debris. In the manufacturing process, what makes Focus decking different? The inner core shares similar qualities to the Hampton using recycled uPVC but with its own specific grading which is sourced from an alternative supply chain. 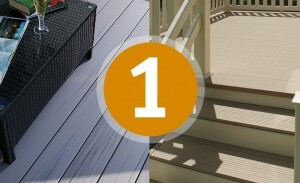 The surface finish is made using another special blend of polymers but has a unique ingredient which will not be found in any other decking products. Encased within the polymers are tiny spheres which are used to give a slip resistant finish. Although contained within the surface material, they are in fact an individual component which protrude very slightly due to them being of a different melt-flow index (MFI), thus creating an almost sandpaper type of finish. A truly unique feature within the decking world and one that is not easy to replicate. Focus decking is available in one colour option, Driftwood, which like the Hampton has also successfully passed British Standard BS EN607 accreditation and is certificated. Focus is an affordable decking product without all the ‘bells and whistles’ of the Hampton but still packs a punch with quality features and comes with a 10-year colourfast warranty. 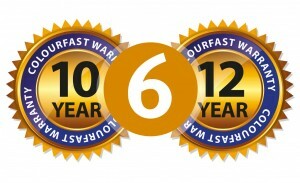 How can Mayfield offer such long warranties? We are able to offer long warranties from results we have achieved from accelerated weathering tests which have shown virtually no colour degradation from UV across the Hampton’s entire colour range. Why is the Mayfield ‘deck clip’ so important? The Hampton and Focus deck clip is a very special little clip indeed. On the surface, it looks just like another deck clip but much thought and engineering has gone into the design and material used to make it. On closer inspection you will find tiny ribs along the inside of the clip which become deeper the closer they get to the centre. These hold the deck plank in place once fitted and prevent lateral movement. One side of the lower clip is longer than the other. This sits flush under the decking planks to prevent the decking from ‘bounce’ which in turn prevents irritating squeaking noises (a common complaint with other decking products). You will also see two holes in the clip. The central hole is the one used for fixing the clip to the substrate. Having a central hole allows individual planks to be removed post installation if a plank needs to be replaced due to accidental damage. The second hole is a secret hole and very few Mayfield staff have been given the reason for its use (no joke!). Mayfield uses in excess of one million of these clips annually and over the four years they have been used, none have failed. They cannot rust as they are made from an incredibly robust thermoplastic plastic. They are virtually invisible due to being a side mounted decking plank design and clear in colour. They are the unsung hero of our decking system but highly regarded in house as one of the key components which make our decking systems the best in the industry.